Client and Server side listeners for events such as toggle, resize, close. Native integration with PrimeFaces themes. Demos are available at PrimeFaces labs. 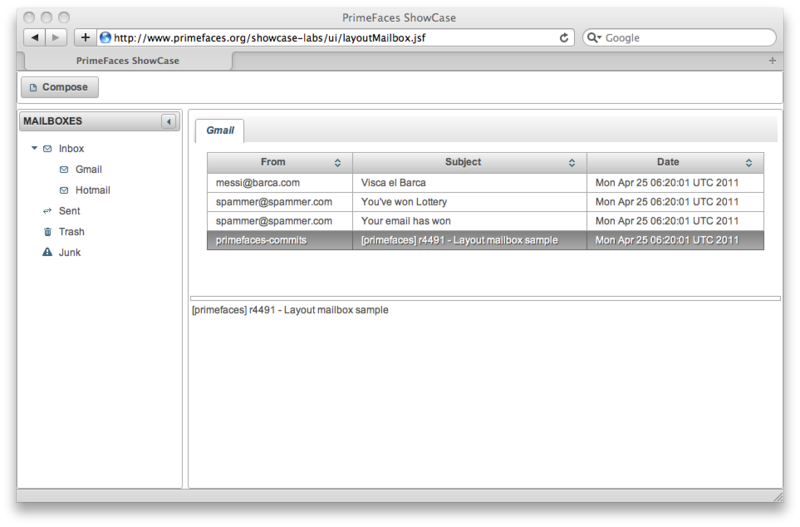 Checkout the MailBox sample that shows various PrimeFaces components in action. Also complex sample has now a menubar and a dialog to show how to use overlay components within layout. – Is the new layout 100% backward compatible? – I’m wondering why the center layout unit in the full page example has the native scrollbar? Is there no way to implement PF scrollPanel? – Unfortunately it is not backward compatible, tried that but just doesn’t fit our new widget. Migration should be easy thanks to migration guide though, it took me a minute to migrate my layouts to new one. – Thought about that but first thing to do is to make sure layout runs fine for everybody then we can think of improvements like that. Same applies to scrollable datatable. Can you point me to the layout migration guide?